Thank you, Toyota Motor Manufacturing, Kentucky, Inc.
Toyota Motor Manufacturing Kentucky renewed a $20,000 grant to support financial education and safety for domestic violence survivors in Kentucky. A loyal donor since 2010, Toyota’s grants have helped thousands of DV survivors establish safe and stable lives through KCADV’s Economic Empowerment program. Read more about Thank you, Toyota Motor Manufacturing, Kentucky, Inc. Governor and First Lady Bevin (far right) with the Program Directors of Kentucky's 15 DV shelters. FRANKFORT, Ky. — Gov. 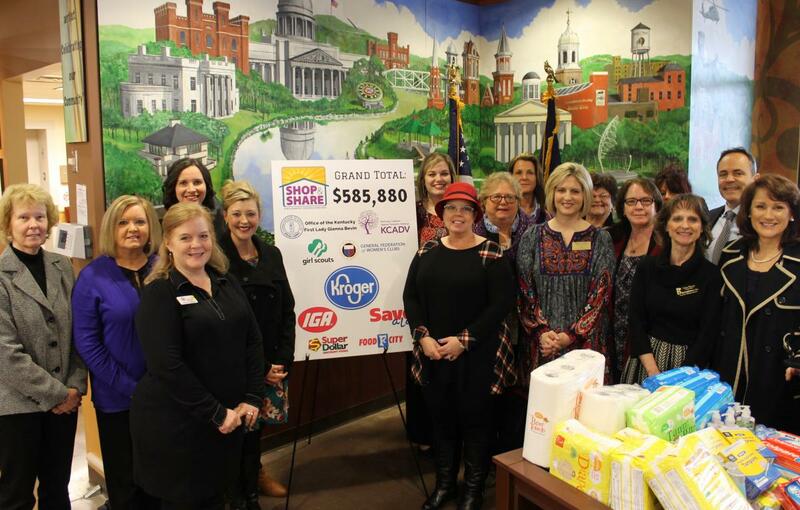 Matt Bevin and First Lady Glenna Bevin joined community partners this week to announce the results of the 2018 Shop & Share fundraiser for domestic violence shelters in the Commonwealth. KCADV received a generous $8,000 grant from the PNC Foundation this month. PNC has been a loyal supporter of the Economic Empowerment Program since 2009. KCADV's Economic Empowerment Program serves 2,000 survivors annually with financial education, emergency fund, free tax preparation and credit building to help survivors get financially fit to live independently. Thank you to the PNC Foundation for making this work possible. KCADV has received a grant from the Kentucky Colonels in the amount of $8,047.62 to purchase appliances for KCADV Homes in Hazard, KY. KCADV is developing 12 units of supportive, affordable rental housing for domestic violence survivors in Hazard. Residents will be linked to supportive services at LKLP Safe House. 2017 Purple Purse Announcement from Peace4KYHomes on Vimeo. Governor Matt Bevin and KCADV have launched the Purple Purse Challenge, a statewide fundraising campaign to provide emergency assistance for survivors of domestic violence. KCADV would like to thank JPMorgan Chase Foundation and Verizon for their support of the Economic Empowerment Program. With their assistance, KCADV was able to serve 2100 victims of domestic violence with economic empowerment services in the last year. This summer, a new law went into effect offering leasing protections for survivors of domestic violence, dating violence, stalking and sexual violence. The Lexington Fair Housing Council and the Kentucky Coalition Against Domestic Violence are offering three free webinars about the new state law this month and in September. The Allstate Foundation has made a $50,000 grant to KCADV's Economic Empowerment Program. The Allstate Foundation has made a national commitment to ending domestic violence through financial empowerment. “Allstate has been with us from the beginning as we developed innovative approaches to financial empowerment for survivors. Specifically, Allstate helped us start a microloan program and a matched savings program for survivors who need to purchase a car,” said Deputy Director Mary O’Doherty. PNC has made a grant of $7,500 to support financial education and credit building for KY DV survivors. Toyota granted KCADV $20,000 to support financial education and safety for DV survivors in KY. Toyota has been a loyal donor since 2010, empowering thousands of DV survivors to establish safe and stable lives.